Markets have been tumultuous last year with the macro factors going haywire. India had to bear the brunt of trade wars, oil prices, fed rate hikes, NBFC crisis and what not. The equity market had hardly given any returns. Going forward, general elections fall in May 2019, which again is an invitation for volatility. In this article, we will discuss five best funds to invest for a duration of one year. Now, since we are talking about a one year duration, we have selected only debt funds, as they are low in risk and more stable. Launched in 2013, this fund has consistently beaten its benchmark. By looking at the table below, we can see three-fold benefits if we put our money now into the fund. Firstly, the SIP amount is as low as INR 500, therefore not a hit on the pockets. Second, the expense ratio is reasonable at 0.32%. The investment objective of the fund is to generate risk-free returns by investing in a portfolio of securities. These securities are issued and guaranteed by the State and Central Government. If we refer to the table below, we can look at how Kotak Low Duration Fund has beaten its benchmark CCIL T Bill Liquidity Weight. If we are in a tussle because of the market going southwards and would like to garner risk-free returns, Kotak Low Duration Fund is one of the best we can look for. The expense ratio of this fund is as low as 0.31%. With a reasonable amount of SIP at INR 500 and expense ratio at 0.77%, investors can look to invest in this scheme for a time horizon of one year. The investment objective of the fund is to generate stable returns by investing in short term fixed income securities. This fund has a reasonable AUM as compared to other funds in the same category. Therefore, it can grow even further in the coming years. 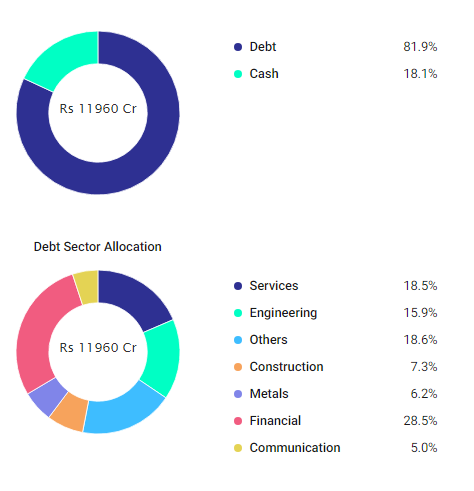 How to Calculate Your Tax Liability in Debt Mutual Funds With Indexation? The objective of the fund is to provide regular income and constant capital appreciation. This fund is preferred by investors as it has a low expense ratio of 0.32% and a low AUM. This fund is excellent if you want to invest in a fund which can you decent returns and shield you from market volatility. The fund has consistently beaten the returns provided by its benchmark VR Bond. The investment objective of the fund is to generate regular income to the investors primarily through investments in fixed income securities. If you have idle money and want to invest for a short amount of time, or if you just want to attain stable returns by taking low risk, you can opt for these 5 funds.